Earlier this month I finished an eBook version of Critter Tales. It worked out as a series, really, with each set of tales becoming it's own volume in the collection. Now comes the ongoing job of promoting, and I was wondering if any of you faithful readers would be willing to help. Here's how it would work. If you are willing to sponsor an eBook giveaway on your blog or website, you would receive a free review copy of the Tales of your choice (in the eBook format of your choice). After you run your giveaway, you would contact me with the email address of your winner and I would send them a free copy of the same book. If you agree to participate, then I expect you to follow through and hold the giveaway. You set up the giveaway as is convenient for you: dates, length of time for readers to enter, deadline, and how you draw your winner are up to you. You can open up your giveaway to the entire world, because these are eBooks so there is no postage involved. You don't actually have to write a review for the book you give away, but if you do, you must state that you received a free copy in exchange for your honest opinion. All the copies (review and winners) will come from Smashwords, because they allow me to set my own discounts up to 100%. The books are available at Amazon and other online vendors too, but only Smashwords lets me give away copies for free. Speaking of free, the introduction to the series, volume I, Concerning Critters, is permanently free at Smashwords. You'll find that here. It sets the stage for the tales that follow. If you think you might be interested, you can take a look at all the volumes here. It would be nice to have a couple of giveaways for each volume, so I'll work that out with volunteers on a first-come-first-served basis. To find my email address, click on "View my complete profile" here, or at the top right-hand side of my blog. A link to my e-addy is listed in the left-hand column. People love giveaways and they are a great way to build followers and readership. I think your sponsoring a giveaway would be beneficial to both of us. Let me hear from you if you're interested! Before we could turn the goats into the garden, we had to harvest our sweet potatoes. Sweet potatoes usually do well for us, but less than half the slips I planted survived our hot, dry summer. Then the ground was so dry and hard that it was difficult to dig them out; it was more like chiseling than digging. All I got was this. It may be a bit early to do this, but I picked the best one to put in water in hopes of growing some slips. If they make, maybe I can pot them once they have roots and leaves. If I've said it once, I've said it a dozen times - something is better than nothing. At least I have something in hopes of next year's sweet potatoes. Do you all remember that I participated in the Back To Basis Living Bundle earlier this year? This was a bundled eBook package with over 65 individual eBooks and courses written by homesteaders for homesteaders. It had a lot of excellent information on homesteading, homeschooling, cooking and gardening, DIYing, green living, preparedness, and natural remedies. For the amount of information it was a really good deal. I decided to participate again for the 2017 B2B Bundle. The group is currently looking for more authors to join the project. The only caveat is that the deadline is October 31st. Joining in means earning a commission for your plus an affiliate percentage for the bundles you sell. It also means being able to share your work with a larger audience and getting useful information out to people who want it and appreciate it. Plus it's fun to meet other authors with similar goals and interests. If you're interested you can sign up at the Back To Basics Author Referral page. You can share a previously published eBook or one you're just getting ready for publication. If you have any questions, I'll answer if I can. The other day Dan helped me move the electric net fence. The girls had finished their brush control duty, so I wanted to partition off part of the the garden for them. I'm still getting a few tomatoes and green peppers, also sweet basil and some okra, but the rest is done for the year. At least it's done trying to grow vegetables - weeds are going gangbusters. The garden will make some good eating for the goats, especially since the pastures are all dried up. The only problem is that this is unfamiliar territory for them, so they won't go down there by themselves. They wait for me to lead them through the gate and expect me to hang out with them. Sometimes I'm able to sneak off and they don't notice. Then a car whizzes by or a scary kitty cat comes along and they all go charging back to the barn. Once they get their fill we'll see about trying to make it look like a real garden once again. Ordinarily I would like to have everything prepared and planted by this time of year, but the soil is so hard and dry from no rain that's it's impossible to do anything with it. The wiregrass hasn't minded, though. It is fast growing and tenacious and is what is covering the ground in all the photos above. Even most of my cardboard and wood chip mulch has disappeared under it. One thing I've learned about trying to live off the land is that it requires patience, faith, and a willingness to adapt annually. The results aren't predictable and there are no guarantees. It's a humbling way of life. The other day I took inventory of the deep freezer. We're going to be harvesting meat soon, and I need to make room in the freezer for it. Besides meat I store bulk grain in my freezer, also my shredded mozzarella cheese, frozen eggs, and unbaked pies. I add peaches, blueberries, figs, strawberries, elderberries, raspberries, and tomatoes as I harvest them. Now it's time to start turning those into jelly, jam, and sauce. I decided to pull out the frozen tomatoes first and begin pizza sauce making. While I was in there I grabbed a small chevon roast and decided to brine it after it defrosted. The next day I put the tomatoes in a colander to drain. I started freezing tomatoes when I learned that peeling frozen tomatoes is easier than the boiling water and ice dunks. Now that I have my Roma Sauce Maker (photo of that here, plus the recipe for my pizza sauce) it's even easier to simply run the tomatoes through it to remove the seeds and peels. I drain out the tomato water from defrosting first, however, to save on sauce cook-down time. I save it for things like - well, you'll see. Next I made the brine for the roast. I use the "all-purpose brine" from Michael Ruhlman and Brian Polcyn's Charcuterie: The Craft of Salting, Smoking, and Curing (a must-have book for home meat processing.) I scaled it down for my small roast. Stir to dissolve the salt and sugar. Add meat and optional seasonings as desired. My optional seasonings were a big handful of fresh cut rosemary and a small handful of fresh garlic. These made a nice bed for the roast in the brine. Brining time was about 4 hours. After lunch I drained off the brine and discarded it. That's not something I would ordinarily do, because my frugal nature requires that I use and reuse everything I can. But the brine was used for soaking raw meat which meant it wasn't safe to use again. I saved the rosemary and garlic to add to the roast for cooking. I also added one cup of my tomato water and put it in the slow cooker on high for about two hours, then low until it was done. Fresh baked bread and steamed carrots rounded off the dinner. Here's the embarrassing part. The finished roast was beautiful and I honestly meant to get a picture. But it had been smelling so good all afternoon and we were so hungry that I forgot about a photo until it was too late. And the pizza sauce? It's still cooking down in my crock pot, but it smells might good too. When it's thick enough I'll can it. People often ask what goat meat tastes like. I don't think there is any way to correctly answer that question. It doesn't taste like beef, pork, mutton or lamb, or venison. Each kind of meat has it's own incomparable flavor. I've heard rabbit, snake, and alligator meat all compared to chicken, but I've had them all and no, they don't taste like chicken! Heck, even turkey doesn't taste like chicken. The only answer is that chevon is a red meat and that's what it tastes like. Now we can look forward to some good soup from the leftover stock and meat scraps. The bone will be saved for broth. October is the month we can usually expect our first frost. Most of the planting should have been done by now, but with so little rain last month, the soil is either powder or hard as a rock. It's also the month in which we tend to some seasonal chores. So what's on the to-do list? I mentioned in this year's Master Plan post that we are changing where we grow field crops to a different paddock. but with the ground so hard from so little rain we're behind on soil preparation here. Deer and turkey seed is an inexpensive way to plant a winter pasture. 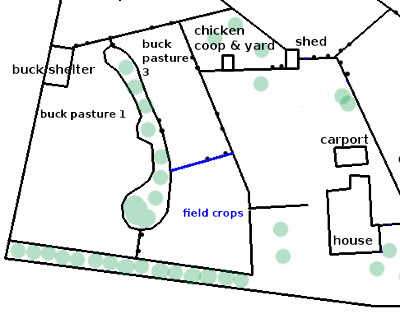 I like to sow pasture seed right before it rains, because I don't like to leave it sitting on the ground, even mulched (see "A Modified Fukuoka Method of Planting Winter Pasture") because of the chickens. Usually I hand broadcast to fill in bare spots, but it will take more this year because we lost most of our pasture due to the hot, dry weather. Given the opportunity, the chickens will consume every last pasture and crop seed we plant! That means they will have to stay confined until the seed is sprouted and growing. On the to-do list are wing clipping and checking the chicken yard fence for any escape points that need to be mended. We can start this when the days are too cool for flies. This year it will be mostly ducks and maybe a few chickens. Here's part of what we have done. Here's part of what still needs to be done. These need to be cleaned of soot and buildup inside the pipes. Seasonal chores put projects on hold, but we'll still work on finishing the Little Barn as we can. First coat of barn paint on the new door and first windows in. What about you? What's on your October to-do list?